Well, one American found out that calling a Congresscritter could result in an attack on him by the IRS just because he had the gall to call and ask questions. A writer for PJ Media called the office of Texas Democrat Sheila Jackson Lee and instead of being treated professionally by this woman’s staffers, the writer was called names and his questions were ignored. The writer called the Democrat’s office because on the floor of Congress she uttered an outright lie and the writer was seeking a comment on the incident. This was not only a lie–the Democrats did try to impeach Bush–but Jackson Lee herself was a co-sponsor of the effort! He then accused me of being un-American, raising his voice at me while asking me to calm down, and telling me that I am just on some mission to destroy our country. When I calmly asked for his name, he said “I don’t have to give it to you because I don’t want to show up on some right wing blog and be on your Twitter account.” Keep in mind, I never said who I was — he just made assumptions and attacked me. When I reminded him that he gets paid by our tax dollars, he said “I doubt you even pay taxes and the IRS will find you soon enough,” and hung up on me. The writer tried to call a second time and was treated the same way. 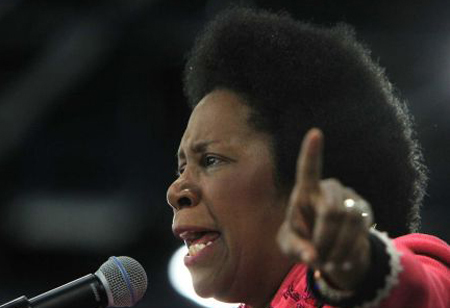 You might recall Sheila Jackson Lee as being one of the dumbest people in Congress. Here is a short list of just a few of her past stupid statements. She Wanted “Unemployment” Payments for People WITH Jobs. She said Congress’ job was to give Obama “Executive Orders” he could sign. She said the 225-year-old U.S. Constitution was “400 Years Old”. In 2005 she said Neil Armstrong planted a US flag on Mars in 1967. In 2010 she was happy that “North and South Viet Nam” were cooperating so well. In 2010 she said that all tea party members used to belong to the KKK. In 20131 she claimed she was a “freed slave.” And she wasn’t speaking metaphorically, either. In fact, she probably doesn’t know what metaphorically means.